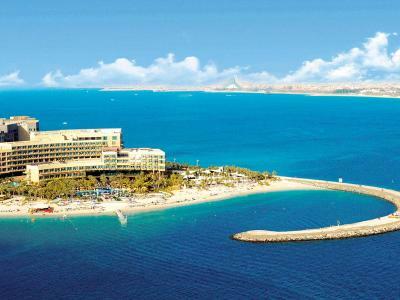 Lock in a great price for Rixos The Palm Hotel & Suites – rated 8.8 by recent guests! The breakfast was good - a large selection of quality items. The staff were friendly, courteous, always willing to assist. Everything is perfect the view,cleaning,pool and food. The best thing in the hotel was Javed with his amzing smile and welcoming spirit and also special thanks to Mahmoud he was very helpful. Everything was more than amazing we are very delighted with the experience,they are very generous and definitely we will be back.,highly recommended. 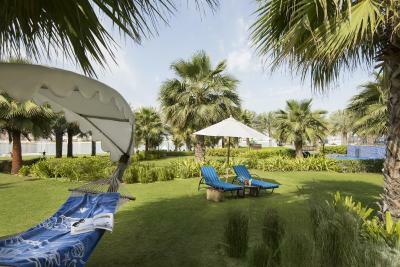 The hotel offer a beautiful experience for those who like to relax and enjoy the beauty of nature. They have thought of everything to make it a wonderful experience. We have enjoyed the beach, the surrounding benefits, the food was really tasty. The staffs were really helpful and were there to address any needs we have requested. The staff were friendly and helpful. The room was clean and spacious. 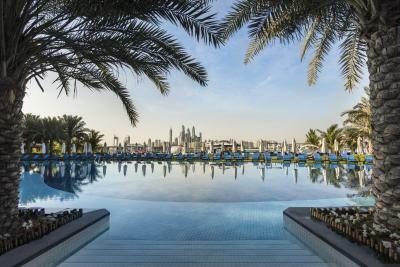 Rixos The Palm Hotel & Suites This rating is a reflection of how the property compares to the industry standard when it comes to price, facilities and services available. It's based on a self-evaluation by the property. Use this rating to help choose your stay! 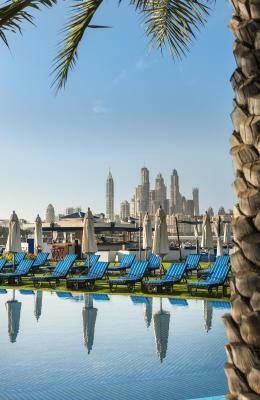 One of our top picks in Dubai.Located on the fronds of the iconic Palm Jumeirah, Rixos The Palm Dubai is a luxury multi-concept beach resort offering panoramic views of the azure waters of the Arabian Gulf, the glittering skyline of Dubai Marina and Dubai’s prominent landmarks. 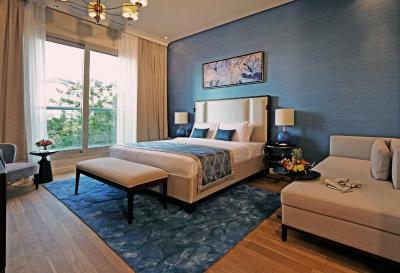 Each of the 316 rooms and suites offer at least one balcony with a sea view and are decorated with modern Turkish design. 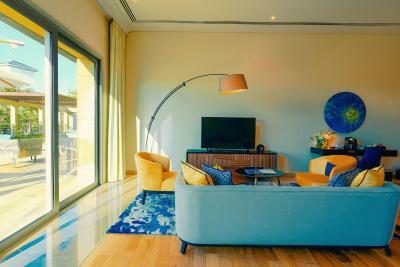 Each features flat-screen TV, free WiFi and mini-bar. All have a bathroom with a soaking tub and a glass-enclosed shower. 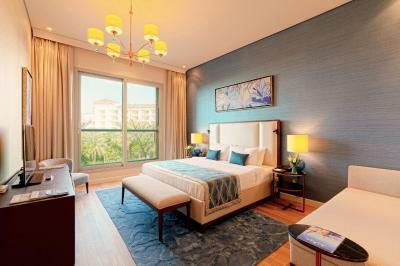 When would you like to stay at Rixos The Palm Hotel & Suites? 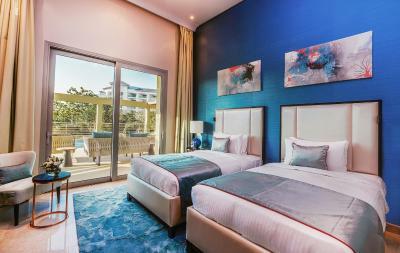 Each generously proportioned Deluxe sea View Room provides beautiful accommodations in Dubai with a king bed or twin beds, offering an oasis of serenity from the world, courtesy of floor-to-ceiling windows. 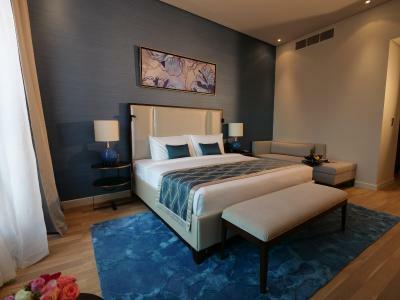 Each generously proportioned Deluxe Garden View Room provides beautiful accommodations in Dubai with a king bed or twin beds, offering an oasis of serenity from the world, courtesy of floor-to-ceiling windows. 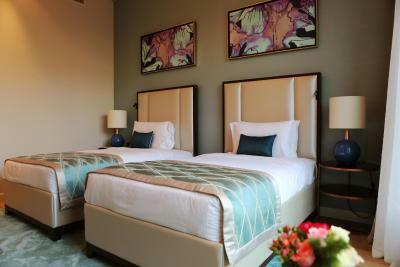 These extra-spacious Premium Rooms 213 ft² offer a garden view with King bed or twin beds and a living area. Marble bathroom with a deep-soak bathtub and standalone rainfall shower. Lounge area with executive writing desk. 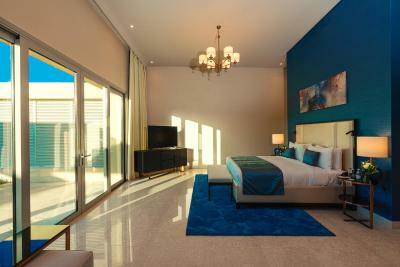 These extra-spacious Premium Rooms 213 ft² offer a sea view with King bed or twin beds and a living area. Marble bathroom with a deep-soak bathtub and standalone rainfall shower. Lounge area with executive writing desk. 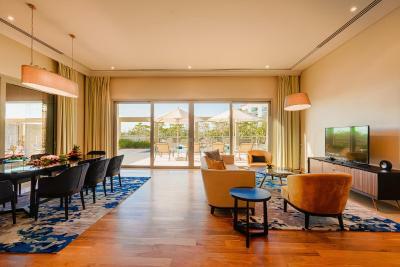 Enjoy superior comfort and luxury with the Senior Suites that come in different layouts featuring panoramic views of Palm Jumeirah or the beautiful gardens surrounding the resort. 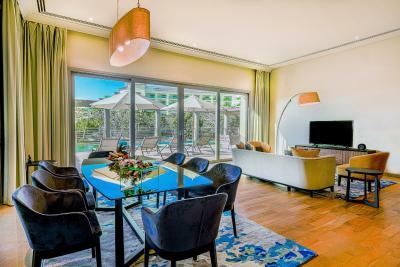 The spacious living room provides ample space for recreation with family or friends. The spacious living room features a business desk perfect for those looking for an office away from work, and a cozy sofa, dining table and powder room. There is a Mini-bar and maxibar, air conditioning, safety deposit box, parquet flooring (Balcony with sun loungers (subject to availability). illy espresso machine and tea amenities, two 40” plasma TVs and high-speed WiFi connection. 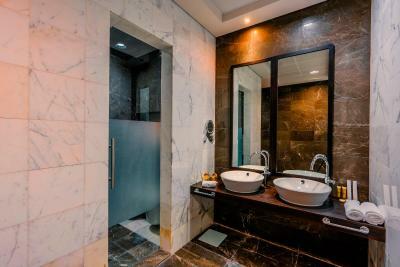 In addition there is a marble bathroom, and a standalone duo rainfall shower with body massage spray jets. separate from the bedroom. 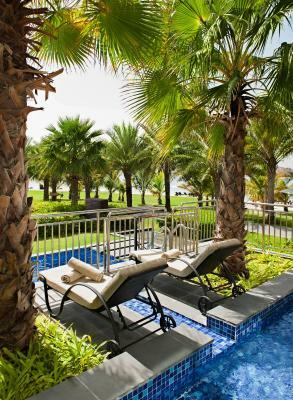 Guests can enjoy sweeping views of Palm Jumeirah or the beautiful gardens surrounding the resort. 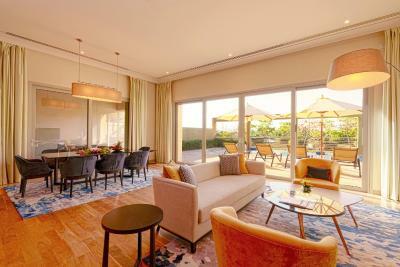 The lounge area comes with a cozy sofa, and the private study with an executive desk. 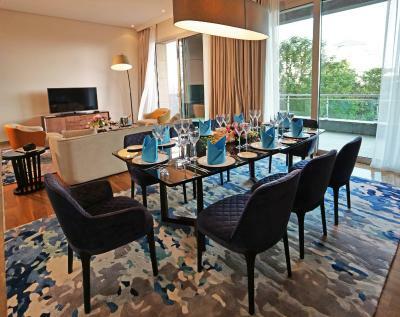 There is a Mini-bar, Maxibar, illy espresso machine and tea amenities, safety deposit box, air conditioning , 2 40” plasma TVs and high-speed WiFi connection. The marble bathroom features a deep-soak bathtub and standalone rainfall shower. deep-soak bathtub and a standalone rainfall shower. 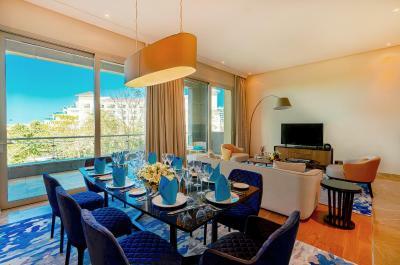 There is a spacious living room featuring a lounge, dining area, modern TV room and a private study room. 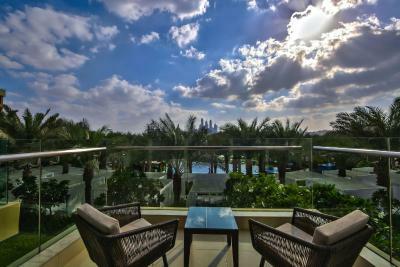 The expansive terrace is overlooking the sea and Dubai Marina, a lounge area, a Jacuzzi™ and sun loungers. The suite has a mini-bar, a maxi-bar, tea and coffee amenities, safety deposit box, 5 40” plasma TVs and high-speed WiFi connection. vantage points in a modern and stylishly decorated suite. 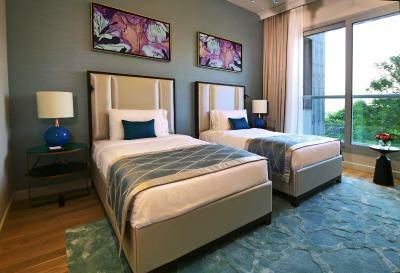 The suite offers two bedrooms with king size beds, private study and a spacious walk-in closet. 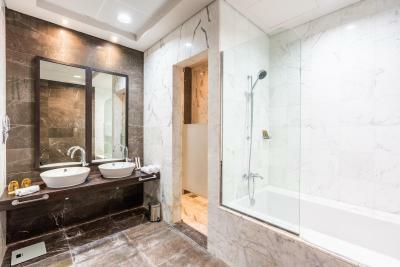 It has an ensuite marble bathroom with a jacuzzi™ and a standalone rainfall shower. 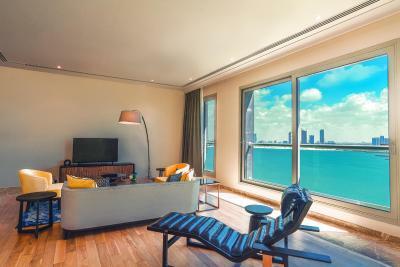 There is a lounge area adjacent to a private dining room, and two spacious balconies overlooking the sea and Dubai Marina. The suite has a mini-bar, a maxibar, tea and coffee amenities, safety deposit box, 6 40” plasma TVs and high-speed WiFi connection. 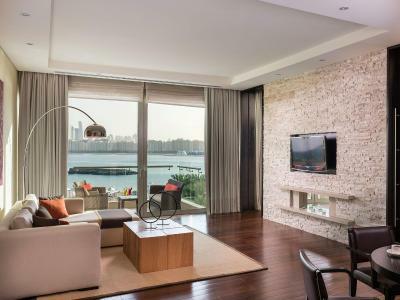 With the backdrop of a panoramic view of Dubai’s glittering skyline from all principal rooms, the Two Bedroom Suites ensure a deluxe holiday experience in a luxurious resort on Palm Jumeirah. 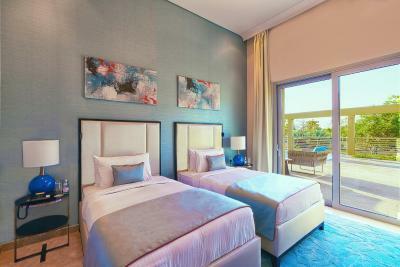 The master bedroom offers a king size bed, a walk-in closet, ottoman and an private bathroom. 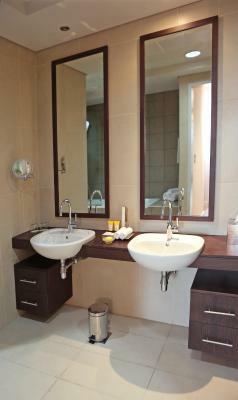 The bathroom features a deep-soak bathtub and a standalone rainfall shower. 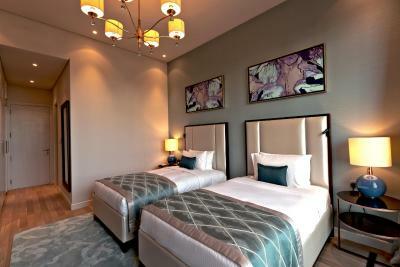 The second bedroom with twin beds and an private bathroom with a standalone rainfall shower. There is a lounge area with a dining table and a powder room. 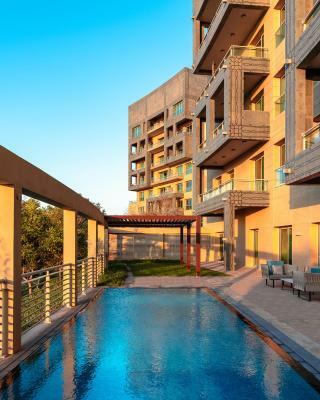 There is a Mini-bar, Maxibar, illy espresso machine and tea amenities, safety deposit box, air conditioning , 2 40” plasma TVs and high-speed WiFi connection. beach as well as a private garden and plunge pool. There is a a mini-bar, a maxibar, tea and coffee amenities, safety deposit box, 40” plasma TV and high-speed WiFi connection in the room. The marble bathroom features a deep-soak bathtub and standalone rainfall shower. This suite has a mini-bar, flat-screen TV and tile/marble floor. This suite has a seating area, mini-bar and tile/marble floor. 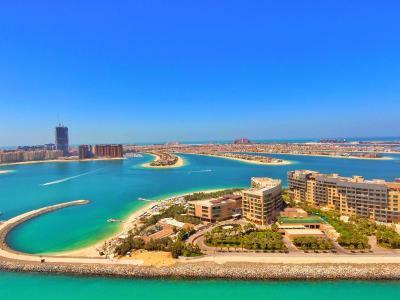 360° view spans the azure waters of the Arabian Gulf, iconic landmarks, the glittering skyline of Dubai Marina and the remarkable lagoons of The Palm Jumeirah. 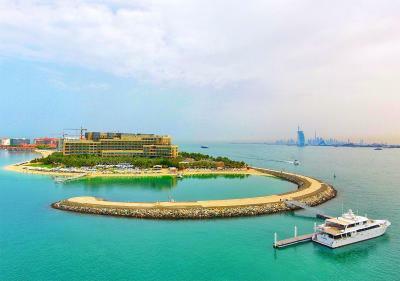 Simply arriving at Rixos The Palm Dubai hotel will take your breath away. 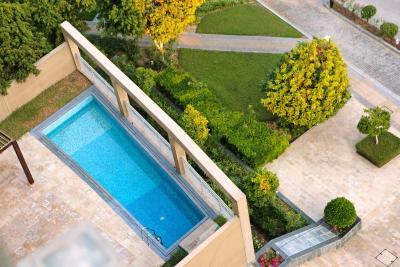 House Rules Rixos The Palm Hotel & Suites takes special requests – add in the next step! Rixos The Palm Hotel &amp; Suites accepts these cards and reserves the right to temporarily hold an amount prior to arrival. Rixos The Palm Hotel & Suites accepts these cards and reserves the right to temporarily hold an amount prior to arrival. 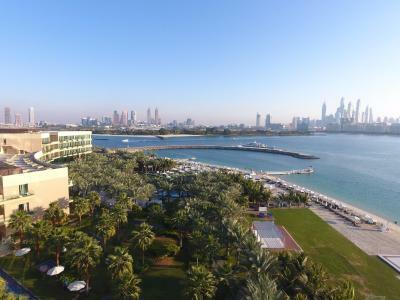 Please note that all guests are required to present a valid ID upon check-in, in compliance with UAE law. Original passport, UAE Emirates ID, GCC ID’s are accepted. Please note that all bookings required a full payment, a secure link will be sent by the hotel reservations team for credit card payments. Payment is required to be made with 24hours of booking. Visa, Amex and Mastercard payments are accepted through the secure link. Bookings may be canceled in case of non-payments. Please note that there will be a compulsory New Year's Eve Gala Dinner on the evening of the 31 December priced at AED 2500 per adult and AED 1250 per child between the ages of 4 and 12 and is not included in the room rate Children below the age of 4 dine with compliments. All Inclusive accommodations is free of charge for the first child aged under 12 sharing a room with their parents. 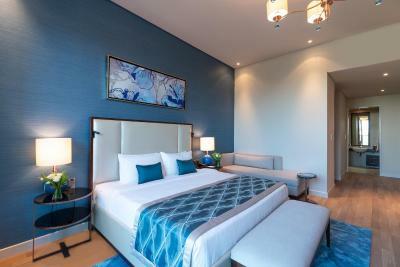 For a second child from 6 to 12 years old a supplement of AED 200 per night will be charged upon check-in. Please inform Rixos The Palm Hotel & Suites of your expected arrival time in advance. You can use the Special Requests box when booking, or contact the property directly using the contact details in your confirmation. Please note that the full amount of the reservation is due before arrival. Rixos will send a confirmation with detailed payment information. After full payment is taken, the property's details, including the address and where to pick up the keys, will be sent to you by email. This whole experience was sadly not consistent with a 5 star hotel. I had explained pre-booking that we were celebrating our anniversary and my husband's birthday. As such, we were promised 'cake, sparkling juice and a room decoration' - we received some rose petals on the bed. The shower had a horrible smell so on our arrival we had to have the maintenance/cleaners look at it and give it a clean. The attitude of some of the staff was not what I expected for a 5 star hotel like this - unprofessional, distracted and rude. The food at the beach bar was very disappointing. We ordered a few sharing items and had to send back the shrimp salad which was not fresh, had tiny prawns with their shells on, and a distinctly unappetising fishy smell. The spa was a huge disappointment. I had booked a couple's hamam, massage and Jacuzzi for my husband and I to celebrate our wedding anniversary. On arrival we were ignored by the receptionist, then greeted by a slightly disheveled man in jeans and a t-shirt, taken to a dark and dingy room where a surly lady met us and told us to put the robes on - when she left us to get ready pre-treatment, we noticed the Jacuzzi was filled with dirty, cold water with bits floating in it. It was at that point that we decided to dress and leave as soon as we could without having our couple's treatment. It had been raining during our stay and the balcony flooded and no-one bothered to drain it so it was unusable. Overall the hotel looks tired and run-down which was worsened by the towels placed in the corridors outside the bedrooms to catch the leaks from the rain. All in all a very disappointing experience. The location used to be nice, but the facilities are quite old now. The service is a little slow and the receptionists ad service personnel try to constantly sell you something. The walls had mold and water marks. The room had a moldy smell. It's a family hotel, hence it is loud most of the time. They have cameras even in the private garden areas. The hotel is definitely overpriced. Would not recommend. The shuttle service is nice. The staff service very poor They dont answer quickly , you have to keep calling ! In room dining , reception etc, The food i ordered in my room always late and poor taste !! The chicken pizza has a small portion of chicken (look at the pic) and the butter chicken tasted like hospital food i didnt even finish it also the salad i ordered was missing came after 40 min like really?? I found one of the coffee mugs in the room dirty When we canceled our massage session the spa dont answer our repeated calls Really wont consider any rixos hotel after this experience. Check in should be faster. The landscape, the beach, the room, the generous services, the staff, everything is really great. When i booked there was on the website that there was jetski at the beach of the hotel. When i wanted to book one it was not the case. the man said i have to take a taxi to a other beach.. Very good buffet. A lot of choice of all different kind of food. good service at the beach for drinks etc.. super friendly staff members. Free bus to emirates mall. You can easely get a taxi at the hotel. Rooms need renovations Food is not up to standard Hospitality and staff need to be more professional Certainly I did not feel I got value for quality. This hotel should be a 3 stars hotel and not 5.